I love our complex, complicated, exception for every rule English language! Also I love wordplay, and puns. So when this stamp set combined one of my favourite beverages with word play – I was smitten! So I just had to create a Dreaming of a White Christmas card to send out to some friends this year. The Half Full stamp set was designed by a demonstrator, Linda Bauwin and a Stampin’ Up! concept artist. Linda was awarded this special task last year, when she accomplished the incredible goal of $1 Million dollars in sales! Yes – one million! Obviously a gal after my own heart, Linda loves her wine and this is the set she designed. Isn’t it brilliant!? The images are perfect for colouring with any of our mediums; Stampin’ Write Markers, Blends, Watercolour Pencils, or Aqua Painter or Blender Pens with our Classic Inks. I followed a design that I saw somewhere, as I’d never made this type of fun fold before. I’m afraid I lost the original, so if it’s yours, please let me know so I can give you credit! This fun fold has several steps, so I’m going to do a separate tutorial on it. 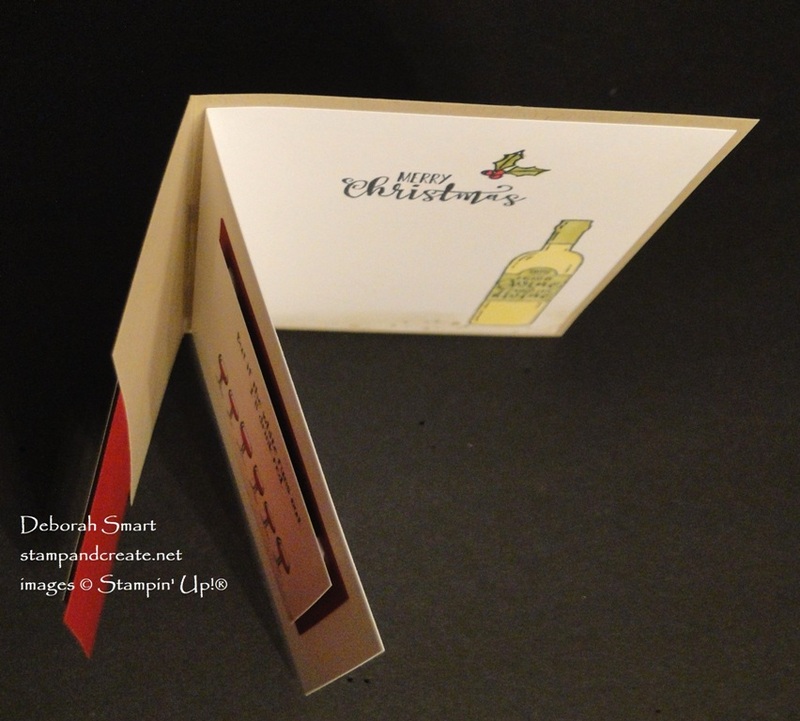 For the details, I’ll just focus on describing the stamping and colours. First, use the Pattern Party Decorative Mask brick pattern, and sponge randomly over the Whisper White cardstock with a Sponge Dauber and Crumb Cake ink. Do the same to the Crumb Cake cardstock front flap. Stamp the spots from the Timeless Textures stamp set in Crumb Cake ink in the bottom right corner, and add some sponging. Next, stamp the glass, holly sprig and sentiment in Memento Black ink. 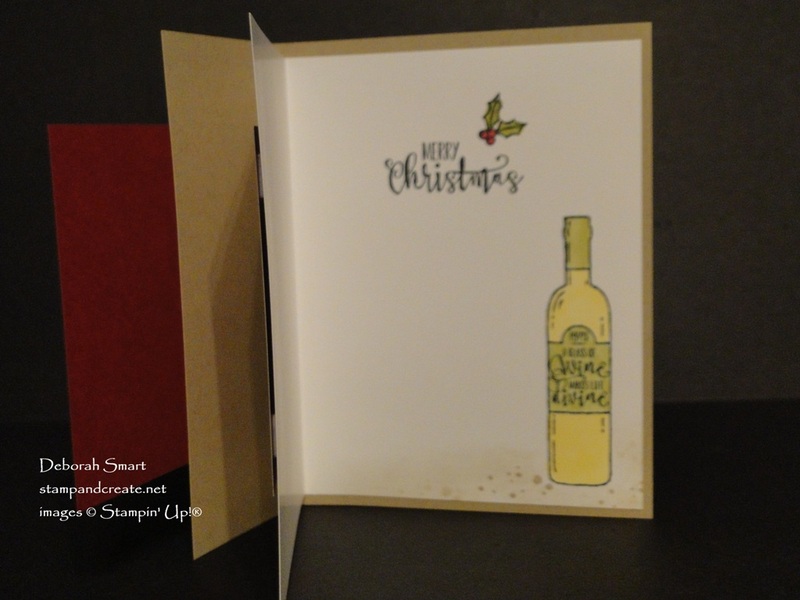 Use the Blends Markers in Dark Daffodil Delight to colour the wine, the Cherry Cobbler Light for the berries and the Old Olive Light & Dark for the leaves. The next ‘layer’ of the card, above, is where the pun is! Stamp the row of glasses image and sentiment in Memento Black ink. Add the spots from the Timeless Textures stamp set underneath the glasses in Crumb Cake ink. 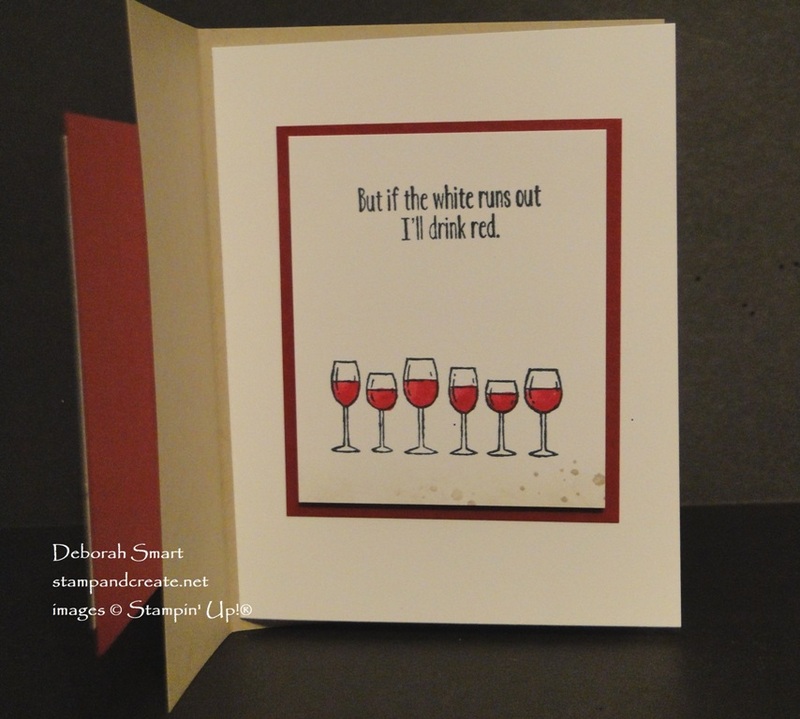 Use the Light and Dark Cherry Cobbler Stampin’ Blends to colour in the wine. I really like that you can order the Blends either in Combo Packs, or order the Light & Dark of each colour separately. Now, we move on to the inside of the card! This is where you would write your own greeting to the recipient. 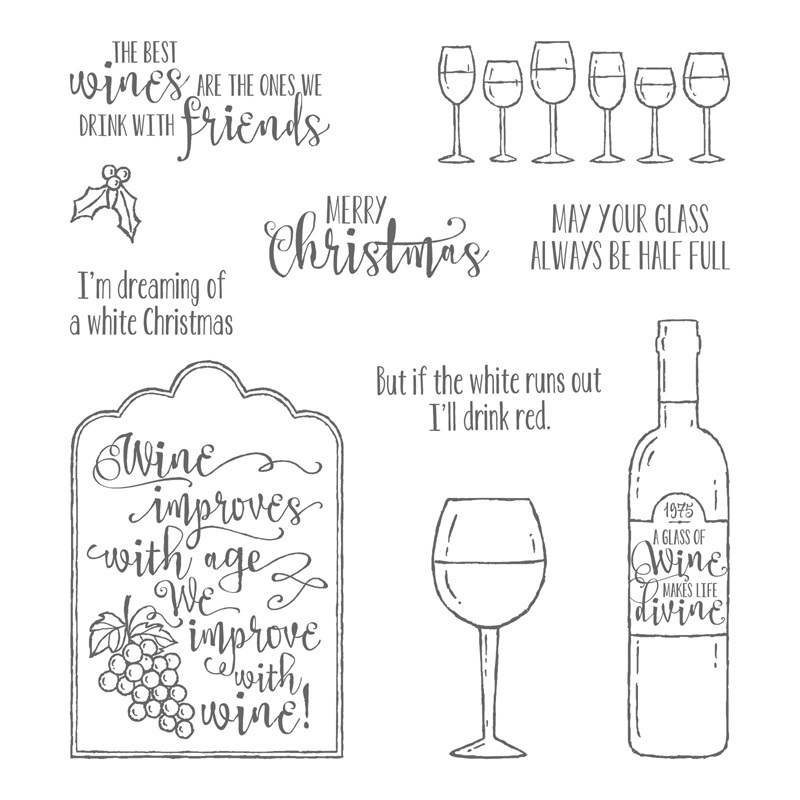 Stamp the sentiment and wine bottle in Memento Black ink. Use a Sponge Dauber to add some Crumb Cake ink under the wine bottle, then stamp the spots from Timeless Textures. So you can see how all the ‘layers’ of this card go together, here’s a view from above. This is a fun fold to make, and it’s not difficult, either! I promise to write a tutorial ASAP to share. Great news – the Half Full stamp set IS going to be carried over from the Holiday catalogue – it’s not being retired! So you still have time to purchase it, and the other supplies if you want to recreate this card. Click on either the product images below, or on my signature. You can shop at my online store 24/7 – whenever it’s convenient for you! I’d love to hear any comments or feedback you’d like to leave, whether on this card, or anything else! I always look forward to seeing any comments, and I also reply to them! Next Next post: GET YOUR FREE CATALOGUES! What a fun “fun fold” card. I have not seen this one before. The other thing I never noticed was the cute sayings in this stamp set. I love them! Great card, Deborah! It’s a pretty cool fold, isn’t it?! I love finding something new 🙂 Thanks for your comment, Susan! 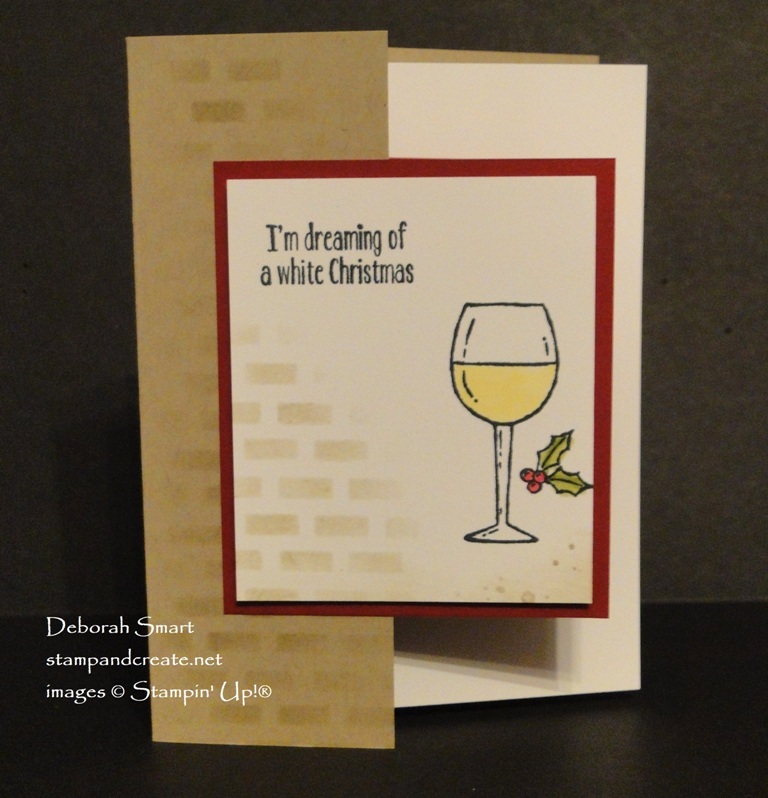 This is such a fun card, Deborah! I love the fold, and that’s one of my favorite sets.